Although California boasts some of the best weather in the nation, sometimes it’s nice to play inside. For those occasions, whether it’s a birthday party or just something new to do with the kids, there are kids’ play centers. From huge playscapes to giant mazes, here are the best kids’ play centers in California. Kidville has national and international locations but the one in Brentwood is California’s only locale. You can find everything to keep kids entertained from classes for kids of all ages and sizes to indoor playspaces. There’s even a style center on site and other things to help parents help their kids have fun. A Magic Forest offers playthings and spaces made of natural materials in a homey environment. With supervised play areas, parents can relax in the café with free Wi-Fi or engage with your kids in the welcoming areas of the play center. Pamper & Play accepts walk-ins, but prefers reservations to help your kids make the most out of their time at the play center. Parents can relax in the lounge, knowing their kids are being supervised. Or book the space for a birthday party or other adventure. Amy’s Playground features 3,000 square-feet of mazes, bounces and more to explore. There’s even a space for babies to play. Check out the website for daily hours, updates, special events and other news. You can pay for a day or save and pay for several experiences in advance. Peekadoodle offers drop in prices for families as well as memberships so that you can visit more often and get special perks like discounted parking, free Wi-Fi, and more. Peekadoodle also has a preschool in addition to play areas, parties and other kid-centric activities. Play Haven is the result of a mother’s understanding of how important play is in a child’s development. The safe play center provides a variety of play modalities and you can drop in or buy passes or memberships for multiple visits. 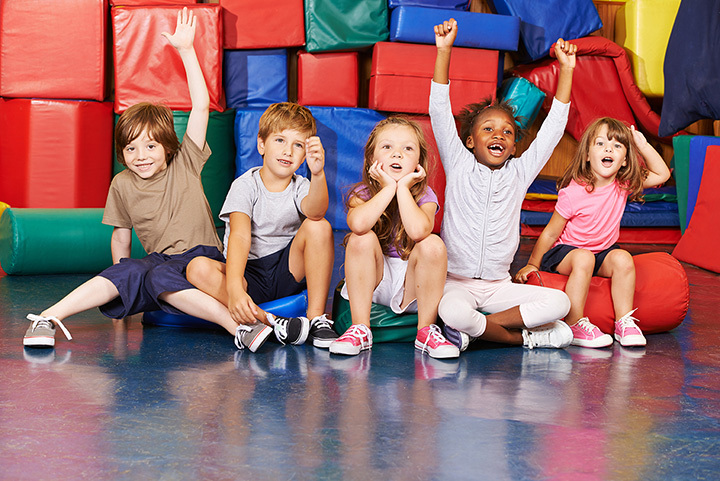 Enjoy classes, events, parties and other activities or just play for a day. La Petite Playhouse is an underwater themed play adventure with three different play areas for different age groups. During the summer, the play center is closed on weekends for parties but open longer hours and even for pajama parties. With drop in hours available and carefully designed for kids under the age of six, Play and Grow encourages kids to learn and get social as they explore the play center. Available for parties and events, Play and Grow is a relative newcomer to the community that focuses on helping kids developing new skills. Party Kingdom encourages the whole family to get in on the fun. Recently revamped, Party Kingdom has new adventures and fun to explore for a great way to stay active as a family. It’s also a favorite place for locals to have birthday parties. Atlantis Play Center is a rare outdoor play center that has additional features to the local park/playground attractions. Animal themed concrete sculptures are meant to be climbed and slid on and provide hours of entertainment for the little ones.